1. Type of goods to be stored as well as the characteristics of the goods. Volume of goods to be stored, for example in tonnage or cubic meters. The frequency and size of deliveries to be received at the warehouse. The frequency and size of dispatches to be made from the warehouse. General environment. 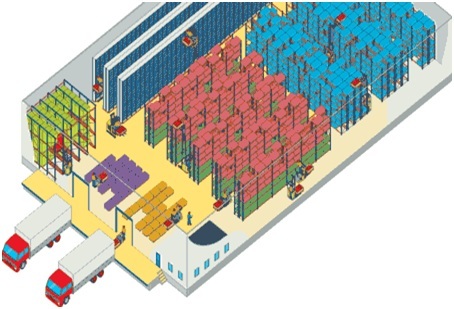 It is important that the new warehouse environment provides a condition that ensures there is no deterioration in the quality of goods during the storage period. Temperature sensitivity, whether the goods need to be stored in a special temperature. Whether the goods to be stored is hazardous materials. 2. Total quantity will be stored in order to calculate total space / area required. The size and weight of the goods including packaging. The need of space for other activities, e.g. repacking, labeling, etc. 3. The storage time requirement. Rules for storage of dangerous materials. Rules for storage of drugs. Choose a location that is close to the port or geographically closer to the factory or stores or based on the requirement. Ideally, we have to choose a location that minimizes the total time that the goods take from the source to their ultimate destinations. Existing building. The construction should be generally sound, no leak, and well ventilated. The inside wall should be cleaned and painted, preferably white. Check for broken windows and doors. Looks for sign of pest infestation, e.g. dropping and holes in the walls and floor. An assessment should be made to check whether the warehouse is suitable based on the requirement. It is better to select a larger space. The floor should be flat and made by a stable material, ideally concrete. The floor must be capable to support the weight of material which will be stored and applicable to the weight of vehicle that might be entered into the building. If we are going to store food, then it is better to have the building disinfected or fumigated prior the arrival of goods. Check the ownership (legal) of the building. Security. This very important factor for warehouse. The security perimeter of the building and warehouse compound/surrounding areas should provide adequate protections for the building, goods and vehicle also equipment in the warehouse compound. Site location and access. Warehouse compound should be free of flooding and access/road to the warehouse should be passed or suitable for large truck. Access to the services such as electricity, water, telephone links and other services required.